Captain O’Grady Homecoming General Shalikashvili, Secretary Perry and President Clinton welcomed home Captain O’Grady and paid tribute to his courage and that of those who rescued him. Captain O’Grady also spoke briefly. He encouraged citizens to thank their friends and family members who are currently in the armed forces for their service. 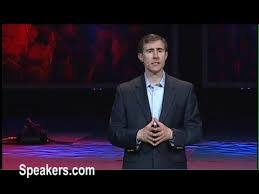 To book Scott O’Grady for your conference or event, contact any reputable speakers’ bureau. Captain Scott O’Grady was born in Brooklyn, New York on October 12, 1965. He moved with his family to Long Beach, California in 1970, then to Ridgewood, New Jersey in 1972, and finally to Spokane, Washington, in 1974. He graduated from Lewis and Clark High School in 1984 and attended the University of Washington for one year before transferring to Embry Riddle Aeronautical University, Prescott, Arizona. Captain O’Grady earned a bachelor of science degree (aeronautical) in 1989 and was commissioned through the Air Force Reserve Officers Training Corps program, April 1989. Following college, Captain O’Grady attended the Euro-NATO Joint Jet Pilot Training Program at Sheppard Air Force Base, Texas, from November 1989 to December 1990. He was then assigned to F-16 pilot training at Luke Air Force Base until December 1991 when he began his first operational assignment flying the F-16 at the 80th Fighter Squadron, Kunsan Air Base, Korea. In April 1993, Captain O’Grady was reassigned to the 526th Fighter Squadron, Ramstein AB, Germany, until assuming a position in May 1994 with the 555th Fighter Squadron in Aviano, Italy. 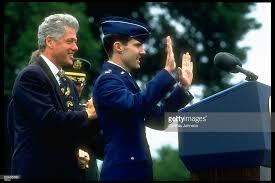 In October 1995, he was assigned as an F-16 pilot with the 466th Fighter Squadron at Hill Air Force Base, Utah. In July 1998, he was assigned to a joint survival agency at Fairchild Air Force Base, Spokane, Washington. After 12 years of military service Captain O’Grady entered inactive reserve status in February 2001. Shortly after, he enrolled at Dallas Theological Seminary and graduated with a masters degree in the spring of 2007. Scott also was awarded an honorary doctorate in public service by the University of Portland in Oregon. 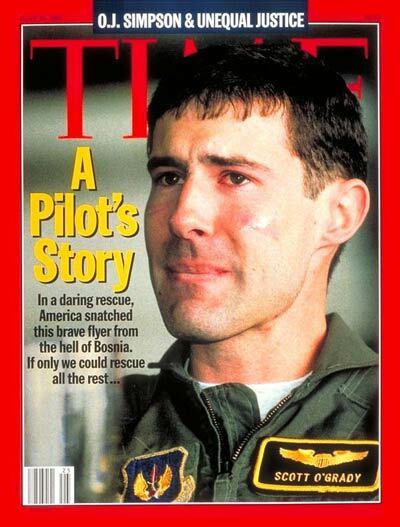 Captain O’Grady was helping enforce the NATO no-fly zone policy in the skies over Bosnia when a Soviet-made anti aircraft missile slammed into his F-16. Capt. 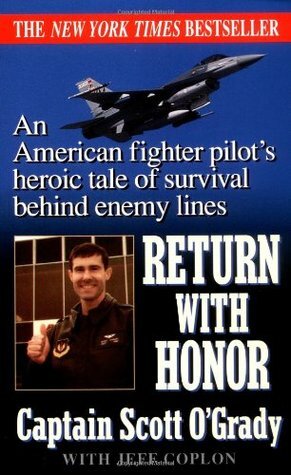 O’Grady tells his incredible story of how he survived in hostile territory for six days before being rescued by the US Marines in his book, Return With Honor, which spent six weeks on The New York Times bestseller list. He has also published Basher Five-Two, a children’s edition of his original story. 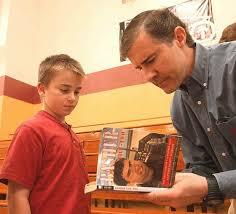 His courageous story has also been documented on the Discovery Channel presentation, Behind Enemy Lines. In addition, Scott O’Grady has been featured on CNN’s Voices of the Millennium, and Then and Now, series that focus on the most influential personalities of the past 25 years. Captain O’Grady has accumulated more than 1,300 military flying hours including over 1,000 in the F-16. Scott has delivered hundreds of speaking engagements. See below for a sectional listing of organizations with whom Scott has worked to elevate their event and company profiles. Scott O’Grady was the guest speaker at our annual all-employee meeting. His powerful account of his six days behind enemy lines is truly riveting. He made our people feel like they were right there with him. His description of how teamwork made a successful extraction possible resonated with our folks in terms of how it takes a team to accomplish a mission. I would absolutely recommend him for your next speaker engagement as over 88% of our meeting attendees responded to a post meeting survey with an “extremely satisfied” rating for our guest speaker – Scott O’Grady. His message is motivational, uplifting and unforgettable. Many thanks again for joining NAPT for our 40th Annual Summit and Veteran’s Day celebration. Here is some very positive feedback. Captain Scott O’Grady joined us for our Veteran’s Day Keynote presentation and delivered a phenomenal speech, capturing the audience’s full attention for over an hour. His message was tailored to our group from beginning to end, always bringing us back to the connection between pupil transportation and service to your country. As our closing keynote Captain O’Grady certainly helped us end on a positive and uplifting note; and for many, the highlight of the entire program was when he led the audience in the Pledge of Allegiance. He (Scott O’Grady) was awesome. Everybody loved him. What a great guy. Would have liked to have spent a few hours with him. We at ITC Safety appreciate the opportunity to have received a high caliber speaker that provided a think positive response to our employees. Thank you Scott for a never give up, think positive attitude! Scott O’Grady’s presentation was right on target for what we were looking for — inspiring, moving, and demonstrated what focus, perseverance and teamwork can achieve. I think that the entire group was completely engaged which was demonstrated by the number of individuals who approached Scott personally to thank him for his service to our country, commend him on his bravery, and reiterate how truly moved they all were by his story. Please accept this letter of appreciation for a job well done by Scott O’Grady, at all 4 of our ITC Safety Summit Presentations. Scott received a standing ovation at each of the presentations and everyone found Scott to be interesting as well as educational with a bit of humor. We had a great evening with Scott. Our customers and employees thoroughly enjoyed hearing him speak and spending a little time talking with him. I am certainly pleased that we selected Scott, and that he could be with us. Xan Guzik / Bergstrom Inc. The event was unbelievable. You could have heard a pin drop once Scott O’Grady started his story. I had heard him speak in November and was as much enthralled as everyone. His story is so moving that even some of the guys were emotional. He made us all so proud to be American. Everything was handled in a proficient and professional manner. Thank you for providing the wonderful speaker and for making my job so much easier. Scott O’Grady tied the presentation into our industry, specifically talking about how we take care of our clients. Even though it happened to him years ago, you could still feel the emotion. There wasn’t a dry eye in the house. If leadership, courage, integrity, family, or faith matter to you or your organization, Captain O’Grady consistently commands standing ovations. I have worked with him on many occasions, and every time he spell-binds his audience, positively changing their world view. He’s just that good. Scott couldn’t have been a better fit for our group and couldn’t have done a better job. Talk about inspirational! Wow. I’ve been coordinating this meeting for 13 years now and Scott was my all-time favorite speaker ever. I received so many positive comments and pats on the back for getting him on our program. If Captain O’Grady is not speaking more and more to people across this great nation, something is wrong. He is one of the most compelling speakers I have heard relay a personal life and death incident in my lifetime. We had one of the largest crowds in years come to hear Captain O’Grady speak. His speech was compelling, gripping, tear jerking and truthful. The crowd was utterly silent when he was talking about having Serbs walk within feet of him in his hiding place. You could have heard a pin drop in the room with 600 people in it. He is a great motivational speaker relaying what it means to be an American and to fight for America and to survive to tell his story. We like hiring keynote speakers that have an instant connection with our members – even before they meet. Scott couldn’t have been more perfect! His story has been out there for a time, but our members remembered it well and got the chance to relive almost every detail and moment as Scott re-inspired them with his miraculous tale of survival, acts of courage, and evident devotion to God, family and country. Scott embodies what’s great about our country and what we can all strive to accomplish and become when we prepare, work hard, and stay focused. 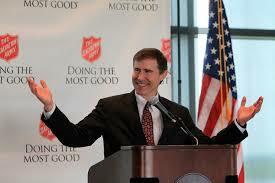 Thanks for doing a great job for the Salvation Army recently. I spoke to the client and they love hosting you and said your message was perfect for their event. Captain O’Grady captivated our audience. They were on the edge of their seats as he shared his story in a way that captured every heart, stimulated our faith and stirred us to focus on the things that are important in life. Scott’s story of how he was shot down and managed to elude the local militias was truly riveting. Just as inspiring, was how he sustained himself over those long days by thinking of his family, faith and love of country. Scott did a great job relating his experience in Bosnia and how it can apply to our daily lives, especially in business. Scott is an American hero. I am grateful for his service and sacrifice for our country. While the dust has not formally settled on the EGSA Fall Conference, our team wanted to reach out and tell you of the value that you brought to the table for our annual event. Your presentation took our EGSA audience through all that you endured during those 6 days. There wasn’t a “phone watcher” in the crowd, as you had them riveted and receptive to your underlying message about relying on your training and focusing on the right things to keep you positive and alive. Finally, when we asked you in our first conversation to “give everyone something they could take away with them,” we wanted you to know that you hit the mark when it came to providing a relevant and timely message. I want to thank you (Scott) for the excellent presentation you gave. He was fantastic! People were riveted by his story. Loved it!